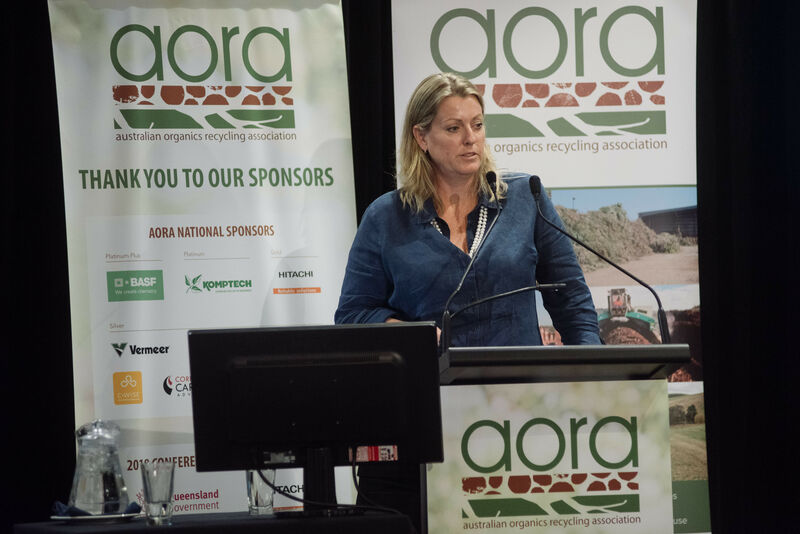 The 2018 AORA Annual Conference provided a significant opportunity to connect the agricultural sector and organics recycling industry. As the principal conference in Australia for the recycled organics industry, the 2018 Australian Organics Recycling Association (AORA) Annual Conference focused on a timely development in the industry – the beneficial use of soil conditioners, composts and mulches derived from recycled organic materials. The theme, Recycled Organics – The Circular Economy in Action, exemplified this topic. Through numerous workshops, presentations, a gala dinner and networking function, the event, which took place 2-4 May, offered an opportunity to gain insights into the latest developments in the organics industry. Experts from around the globe, including academics, government representatives, agricultural businesses and organics recyclers, touched down at the Hotel Jen in sunny south-east Queensland. The recycled organics industry processes around six million tonnes annually in Australia and is seeking to increase its volumes through beneficial reuse. The conference’s theme highlights that where policies, practices and technologies allow, every kilogram of organics has potential for beneficial reuse, taking material back to agricultural and other soils where needed. Importantly, it tackled the key issue of contamination, treatment and risk management, and compost user experience and performance data. The risks of contamination become a particular issue as more surplus organic materials are reused. A cost-effective driver of organics recycling is also generating market demand, which formed the basis of assessing the current performance of the industry. The conference included experts such as Ramani Narayan, Distinguished Professor at Michigan State University in the US, who discussed designing single-use disposable packaging and products for complete biodegradability-compostability. As a representative of Macadamia and Horticultural Services, Brice Kaddatz brought his agricultural industry knowledge – explaining how erosion and topsoil loss causes is detrimental to soil function and health. He addressed how compost could address this problem. Another relatively new organisation, the Cooperative Research Centre (CRC) for High Performance Soils, will use its networks in the agricultural industry to identify soil research priorities and tailor its work towards meeting their needs. It will do so by advancing new products to increase soil fertility and function, while measuring the performance of soils, establishing mechanisms to reward high performers financially and developing new integrated soil management solutions to encourage greater precision. Dr Michael Crawford, Chief Executive Officer of the CRC for High Performance Soils, provided an introduction of the CRC to the organics industry. He told Waste Management Review it is the biggest collaborative soil research effort in Australia’s history, with eight universities, three state government agencies, 19 farmer groups and a variety of industry partners on board. AORA is a partner in the CRC which will help accelerate the uptake of composts and mulches in the agricultural market. He says that the CRC for High Performance Soils was established to help provide farmers with the tools to more effectively manage their soils, improve productivity and profitability and ensure long-term sustainability. The organisation, of which AORA is a member, has secured 10 years’ worth of funding to further its research, including $40 million from the Australian Government, along with $124 million from 39 partners. It was announced in March 2017 and commenced in July 2017. “We are looking at how we can add value to composted materials in a way that makes them more palatable and acceptable to farmers. Some of the major barriers which we want to overcome are the costs associated with transport, logistics and handling,” Michael explains. He adds that for these reasons, the CRC will focus its research efforts on manipulating the end product and increasing the concentration of nutrients tailored to a farmer’s requirements. He explains AORA members will benefit from the CRC with more investment in developing soil amendments from recycled organics, and through opportunities for members to reach farmer groups and access research and researchers from across Australia. “For me, the conference has been a real eye-opener in the great work being done in the organics industry and the opportunities for farmers and the environment,” Michael says. The CRC will be identifying the key physical, chemical and biological indicators of soils in a range of climates, regions and land uses and the development of sensors to better manage these indicators and make sense of big soil data. Research will target the development of novel materials to address surface and subsurface soil constraints, and new moisture-retaining and microbial carrier products to deliver beneficial microorganisms. “In many ways the appropriate technology is available to us, but we can be a lot more precise in tailoring our management because we can better understand the soil chemistry, biology and physics in a way we couldn’t do before,” he says. Michael adds that there is an opportunity to take advantage of the growth of global markets through high-performance soils. In 2018, the CRC will investigate innovative technologies to concentrate and recover nutrients from waste streams with minimal contaminants. They will also seek to boost the bioavailability of waste-derived nutrients from various soils and understand the influence of key waste inputs on the mobilisation and plant availability of major nutrients, including nitrogen, phosphorus and potassium (NPK) – a complex fertiliser required for healthy plant growth. Another newly formed partnership with AORA is the not-for-profit Soils for Life. Soils for Life was established to enhance the natural environment through information and education on leading regenerative landscape management. Regenerative landscape is the application of techniques which restore landscape function, including organic composts, fertilisers and bio-amendments. Natalie Williams, ACT Chairperson, at the conference highlighted the importance of maintaining synergistic relationships between the organics recycling industry and agricultural industry. Soils for Life recently partnered with AORA and the presentation noted the importance the two relationships will play into the future. Natalie tells Waste Management Review an increase in the uptake of the use of compost will expedite the improvement of soil much quicker than traditional fertilisers, due to its higher nutrients and water holding capacity. “Most farmers are still applying non-organic fertilisers such as NPK and monoammonium phosphate (MAP),” she says. She says what’s needed now is rigorous research on a commercial scale and Soils for Life is currently investigating a business case for more regenerative agriculture in Australia. “We’re in the midst of rolling out nine business case exemplars on regenerative land management in Australia – this will form part of 100 case studies.” She says a variety of measurement tools for farmers will be part of the business case exemplars – which highlight regenerative land management practices of a farm in its entirety.